How are you Faith? Oh, I’m just springing all over the place. I know. I feel like I got buds coming out of everywhere. I know. Hi Lois, it’s so good to be back in into a brand new week. We are in a brand new week and boy, we’ve got a tough discussion coming up. The goal that we have in everything we’re doing is to provide more to life and hope that you will grab onto these bits and pieces no matter where you are. It is so much fun this time of year. I love this time of year. Last week we talked about the impact of losing your position and that is such a challenging one, especially as it relates to our identity. So I had some things to work through. Just even bringing those back up to the surface that you think you’ve dealt with and you realize, wow, that still means a lot and it opened a lot of doors and I’m so glad I am where I am now. So revisiting those highlights was great for me. That’s wonderful because revisiting them just mean to just kind of processing the little things that are still tied to it. Hey can we thank all of you by the way and appreciate your comments and ideas that you’re offering us? Thank you. We really do want to reach out to you in whatever transition you may be facing. So as you continue to give us nudges and directions, we are very, very grateful. You know, last week we tackled a really tough topic: addiction. And that’s a very challenging transition and we hope that if you haven’t had a chance to listen to it and maybe if you know someone who might benefit, this is one that we went the full scope of dealing with addiction from a lot of personal experience on many levels of it. So please listen to the podcast. 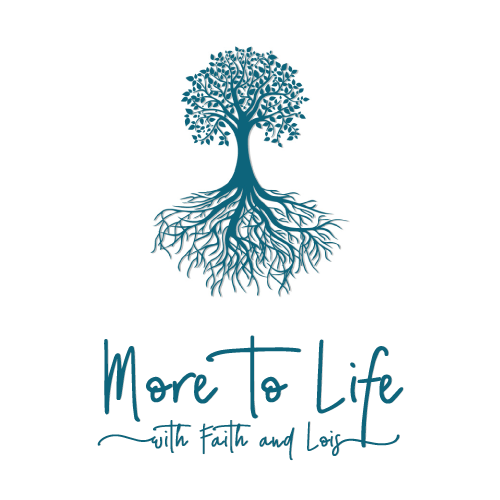 You can go to our website – www.moretolifewithfaithandlois.com. Or the platform on which you are listening to us right now. It was a tough one. But you know it’s spring, and it’s a wonderful time to begin to evaluate what’s going on in life and that’s what we’re here for. So not every transition that we tackle is going to be filled with challenge and heartbreak. Today we are lightening it up as best we can because we’ve entered the season of spring. Oh I love it. And for those of you who like us have had to endure quite a winter, this spring seems to have more life in it than it has for quite some time, Faith. When I’m doing and then my sister is doing, she lives in Minnesota and I know she’s going through the snow looking for those little green things coming up. I’ve been doing the same thing. It’s like it’s so exciting to see something springing forth beneath us. So this is episode 67: Transition: The Impact of Spring. Spring is a season that holds a number of wonderful ideas. We love them, don’t we? I mean the rebirth is part of it. Very much so for me and for so many people that I know spring is kind of a a time to just kind of catch your breath at wonderful spring air that you can take an inhale and digest actually and bring into the fullness of you and who you are becoming and everything you want to do in this season. It’s a deep time of renewal and expectation and that can ignite new passions, new ideas and that’s what we’re going to talk about today. We are and even if from a theological perspective, depending on where you are, resurrection and regrowth, that’s all part of the season now. In fairness, if you’re in the southern hemisphere, we know you are an autumn, which is a transition that is not spring, so bear with us. So we’re going to those stick with Spring because that is what we’re in. You know, spring makes us feel better because for a lot of us who have been denied sun for a number of weeks or have had it like on and off, it actually scientifically helps us release some Serotonin. So we actually feel happier, which is really cool. And the warmth of it, the warmth of the sun, that’s one of the most exciting things is just to be outdoors and go, oh the sun is still shining and it’s still warm and this time a year it gets warmer every day. And so you feel those changes and you feel embraced by the season. So what does the season of spring, Faith, hold for you? New Life. Everything about it. The buds on the trees. I love to drive through this area of Denver and down Sixth Avenue and to see all of the trees and the buds and then the cherry blossoms bloom. So all of the colors and the life, you just see the stages of life happening and it’s so reminiscent of life happening within a lot of what I calculate each and every week is there’s a renewal in nature. What is the renewal within myself? And I’m on the countdown for my hummingbirds to return, which is a one month away. Wow. That’s one of the things I love to do is to see the return of each of the birds that all the different ones that come back to the feeder, we now know the weeks they actually come back and when the swallows return and when the hummingbirds return and we know when to look for them. And so there’s that anticipation of a return – of springing forth. And so just that alone energizing, it’s just that something happens, springs up within of anticipation and hope. So this is a transition and it’s a great transition in terms of being a positive one, but we want to kind of dig into what some things are that we look forward to in spring and the first thing we’ve both already mentioned is that things are in bloom. All of this budding starts to happen, you know, last winter or last fall when I planted all of the bulbs, the daffodils and the crocus coming up first. Then I know when the tulips are going to come up. I know when the, I have a whole list of the timing for all of the early things that happen in spring. And the anticipation with that first green as you mentioned, that you actually talk about with your sister in Minnesota, when you first see those buds coming out, all this work has been happening underground that no one has seen and now it’s coming out. And that’s what I feel like for me, all this work that’s been happening underground in these last few months because there is kind of a, not in a negative way, but kind of a closing in as I’m working on different issues in life – and in spring it like starts poking out like I’ve got buds, blossoms and they just can’t help themselves. Right? Yeah. But because you’ve been stewing for a while in this period of time and it’s been pieces being put into the pot and now it’s ready to come to fruition for you. Yes. Pretty Fun. Look at nature to see what’s happening outside yourself. Absolutely. And the spring cleaning is a big deal because you know, you get eager and they’re like, okay, I want to get out and get the pan and and start, you know, showering down the walls and that type of thing. So spring cleaning is something that is, it’s a way of a renewal of your living space to say, I want to clean it up, the windows go up, you know, and you get the fresh air and all of those things. But there’s also that piece of spring cleaning within – that, what have I discovered in the dormant season and what do I want to change and how do I want to face this? It’s interesting that in the fall and the spring, both my husband who’s a psychologist and my phone as well start ringing more and it’s because the season has changed and it causes some reflection. So there can be spring cleaning within as well. And spring cleaning that reflects on both sides for me as well is this is the time where I go through my closet and I decide, so what in the last six months to 12 months have I really been using. I really do and this is because this is the moment that I finally say, you know, it really has been two years. Even though I tried to say I haven’t used it in 18 months. It’s because somebody else can really use it. But this is, I don’t know what it is about the light that comes through. Maybe we’re close to where the closet is that I can see this has been hanging here for a long time, so I make transitions in my closet this time of year because I’m looking forward to what this next year is going to look like. So it’s a purging of things that I don’t need around, but I also do it with papers maybe because tax season, you know, winds up and you’re cleaning up those kinds of things. I say -is this seven years? I mean, you know, whatever your legal rule is, but I, you know, bring out the shredder. So this is also the moment that I take time to prune things in my life that don’t need to be there. And that’s really good. That’s really good. I don’t cut things off completely and I won’t cut you off, believe me. But I’m just saying there is, it helps my mental health to do a little bit of pruning like that. So you mentioned earlier about more sun. This is also the time where we can get back outdoors. Yes. Doesn’t it feel good? So the water, whether it’s Pacific or Atlantic or the Gulf coast, it’s doable. You can actually start touching your toe in there. Okay, maybe not along parts of the Pacific coast, I get it. But for the rest of us, you know, if you go to visit these places, you can actually start to enjoy. Some of those new activities. For someone like me who rides a bike in winter inside the whole time, now I get to take my bike outside and I just can’t wait for all these transitions. And, and you know what’s funny is people take pictures all year round on Instagram, on Facebook, but you will notice with these turnings of spring how many more images you’re seeing. Even for people who say they don’t care about flowers and trees and outdoors. For some reason right now it’s like, oh, I know right this again. And suddenly you’re seeing all these outdoor pictures for people who normally wouldn’t show that. People are very excited about it, whether they want to admit it or not. And one of the things I love so much is the extra daylight and the extended time of where you can be out longer. There’s not a day that goes by that I will say to my husband, oh look, we still have light in the west. That’s look, look at what time it is. And we could still have, the sky is still lit up and oh, that feels so good. It feels so good to be out of the dark and into the light. And again, it’s so symbolic of what we’re doing, what has been kind of maybe hidden that we can actually expose and bring into the light and heal and change and transform and go, I don’t really need this anymore. You know, even in your dark closet, you get rid of stuff. Yes. You know, you take it out and you get rid of it. You bring it into the light and toss it on such a renewal period of time. And that’s such a key word of new birth, new life renewal. Enjoy it, celebrate it. You know the other day my son saw me with white pants on and he said, I thought you couldn’t wear white pants after Labor Day mom. I said, yes, but it’s spring, so that’s one of the fun things is we get to wear lighter clothing and I don’t mean just in color, but just in weight. For those of us who’ve been in winter climates now I’ll keep my sweaters handy because in Colorado, you know weather can change, but the heavy boots are now going into a corner and the big heavy coats are being put aside for lighter clothing and there’s something about that weight coming off that is a physical weight coming off that is also from the inside. I feel like there are things that I’m kind of shedding that I can be lighter about and it happens with Spring, which sounds weird, but I’m not the only one. If you want to look up people even, right, there are more poems about spring than there are about other seasons and it’s because of this lightness, this free the air, right? All of those things we’re talking about that people like to dive into. Right. Which is why sometimes your mood improve sometimes as you know, because in therapy, some people’s mood is shifting, so it may get to improvement, but there’s a shift happening. But it has a lot to do with the sunshine and the Serotonin and the weather. That puts most of us in a better mood. But it can also bring us to that point of reflection where we’re saying, oh, okay, I’ve put this under for the last several months and now I’m ready to bring up something that he is gnawing at me. Bring it out to light. Absolutely. And you’re gardening thing I know is a huge inspiration to you. The seedlings are almost ready to go out. We have to admit for those of us in Colorado, we have to wait until after mother’s Day. So I’m being, I’m not going to go early however pansies are out because pansies can survive all of this, which I’m very happy for you. A little tiny thing so I’m very happy about that. But yes, gardening that I get to look forward to that I get to get my hands dirty. Although somebody wrote recently, you know I can’t I, why do you do it, Lois, your hands get so dirty? And I said, okay, I get my nails done so why would I get my hands dirty? I wear gloves. I’m just saying you don’t have to get your hands dirty to be a good gardener. Absolutely. I even wear two gloves sometimes, but the idea that the beds that I have outside are prepped right now that they are getting ready, that the compost that has been working its way through the winter is now, you know, stinking up the whole backyard as I’ve got the soil up to where I want it. Yes, I cannot wait for what this does because all that stuff that was happening underground is coming up and that that’s kind of what we’ve been talking about. There’s a lot of things that no one’s been seeing for all these months and now they get to show. And so for our listeners, the question I want to just throw out there is renewal is different for everybody. It looks different, sounds different fields different. But a good question to ask yourself is what is renewal mean to you and what may be in your life for just some reflection time? Can you see changing and seeing morph into something more beautiful and that represents you more as a person? And it’s a chance to do that. And to sit in the sun for an hour or so and just reflect on some of these things and let spring speak to you, but speak back into the season with what do I want to see renewed in my life? And when we talk about growth, what edges of your life have you kind of held back and said, no, I’m too busy. I’m doing something else. What edge could you allow to spring forth into growth? I mean for some of us it’s what we’re going to do physically because we can do more in a physical sense outside. So we will make changes in our physical appearance or exercise or whatever that means. And maybe it’s a growth in that area that we have kind of kept in the background and now we’ve decided we can jump forth on that. There’s a lot of ways we can morph and grow. Absolutely. And so the physical is the one emotionally, how can we grow and mature and develop more as a person? What is missing emotionally for us? What are, what are some of those feelings of pain or hurt or suffering of some sort that inside that you haven’t really dealt with. Get to the root of it. It’s time to maybe purge that and to get some help if you need that along the way. And another one is spiritually, you know, even if you do not have a faith or don’t choose to have a faith, you still are a spiritual human being. So what does that look like for you and what are you doing to enrich that in your life? Do you need to hear a different voice? Speak into your life right now is another way to enhance and to enrich your spiritual growth and development. Don’t become stagnant. Let the stagnant part go away and renew it with new information and new hope and new life. You know, in 2019 we have so many options that we didn’t even a few years ago and the resurgence and the activities that are present in so many podcasts Now of course we want you to listen to ours first. But then after that there’s room for more podcasts. So that can all be about how you thrive and how you blossom and how you grow. There’s so much to read. There’s just physical walks you can take. There are so many ways to engage with people that you care about that this might be one of the places to have a reset and think about it like, uh, you know what? I’m ready to try this again, or I’m ready to try it in a different way. And it’s beautiful. It doesn’t mean you change up your whole life, but this is an element that you get to push forward and it’s all because spring is, here it is. Oh my goodness. There is as zest to the season, even if it’s not your favorite. For some people it’s not. I know I didn’t have a lot of friends who fall still is. Autumn is still their favorite or the winter is they love to go skiing and you know, and they’d love to be out in the cold. You have your favorite season, but each season brings a beautiful gift. Don’t miss it. No. And we’d like to share this poem with you by May Fenn, it’s titled, “It must be Spring” and we’ll alternate on these lines. So see if you can follow along. Hush. Can you hear it? The wrestling in the grass bringing you welcome news that winter days are past soft. Can you feel it? The warm caressing breeze telling you this sticky buds are bursting on the trees. Look, can you see them? The primrose in the lane now you must believe it. Spring is here again. That’s May Fenn, “It Must be Spring,” it just speaks of spring. That sums it up nicely. What a thrill to step into spring with you as this transition marks a change in the season of your life. Maybe this is a week that you’ll plan a picnic to see cherry blossoms or something like that. A feast for your senses. And we hope you feel a sense of lightness and an urge to renew something in your life. Oh, we totally beat ourselves up and we, there’s a lot of times where we’re going to have those moments of, did I do the right thing? That’s a part of it. It’s okay. Yeah. These are all the different steps that you’re going to move through. Maybe we could say you could have done this better in the moment. Plenty of people have said that to me. All I can say is we’re doing the best in the moment that we’re in, right, and we’re going to do our best, trying to pick up the pieces. Please share this podcast with someone you know and join us next week for Transition: The Impact of an Affair..
Get the latest news on our social media platforms and on our website, and please subscribe.